David Swart often engages in recreational mathematics and mathematical art that takes the form of constructing and destructing spheres into flat shapes. David is very happy to have the talented Elisabeth Gillies help with the music for this short film. Elisabeth Gillies is a local musician who has been studying piano and theory since the age of 5. She is also a self-taught guitar, ukulele and mandolin player. Recently, she has been doing more accompaniment and composition. Elisabeth is thrilled to be a part of this project, and hopes you enjoy it! 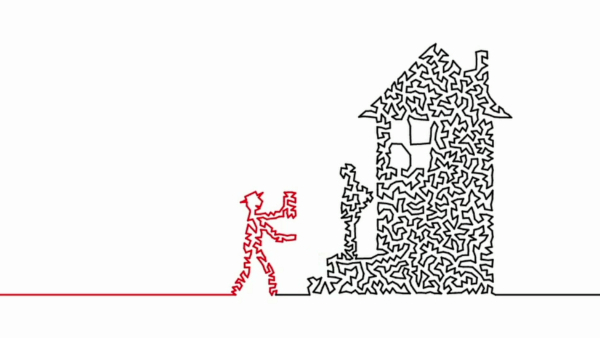 Let's imagine if the travelling salesman (of the Travelling Salesman Problem fame) were animated from a single continuous line (the same kind of continuous line we see in Travelling Salesman solutions).